Myriad Dance Company in Tides at The Clubhouse SLC. Photo by MotionVivid. Myriad Dance Company presented Tides at The Clubhouse SLC, the space formerly known as the Ladies Literary Club. Seven short dances were choreographed by different members of the company and strung together with recurring piano and rainwater music. Tides intended to explore how life changes while also remaining the same. To that end, the company used water as a metaphor. The water motif was incorporated in their transition music and costumes -- variations of watercolor blue pants and crop tops, though the dances themselves seemed to be less focused on the concept. The evening opened with the full eight woman company leaning back against the stage in artistic director Temria Airmet’s “The Roof is on Fire.” Temria broke away from the group, gesticulating and fanning herself as she climbed the steps to the stage for a brief solo before being joined by the group in a fast-paced unison sequence. Those who have attended a performance at the Ladies Literary Club may be familiar with the unique layout of the space. A small stage is in the center, as well as a large floor area where the audience chairs are arranged. The performers utilized both stage and main floor in their dances and entered and exited from behind the audience, as well as either side of the stage. 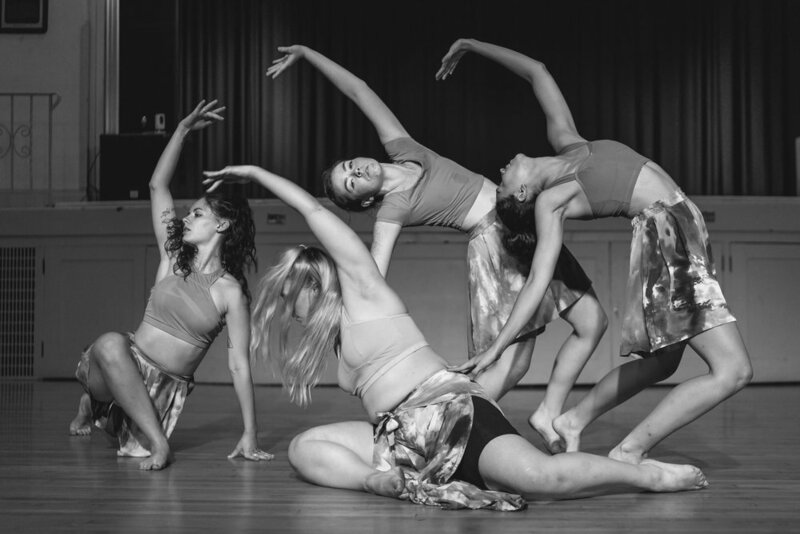 Myriad Dance Company’s dance aesthetic could be described as contemporary modern dance; movements that flow between jumps, extensions, and floor work, and accompanying head rolls and gestures. To this vocabulary, Kendall Fischer’s “In a Drop” added surprising moments of partner work, with dancers appearing out of the group to fling each other in a circle, or transfer a performer onto the stage upside down. Ashley Creek’s final solo in “Everything is Temporary” also played within their aesthetic, captivating the audience with her intense effort to create tension in her muscles, tightening up until she was visibly shaking. The company was at its strongest when they found a musical beat that could drive their sharp, discrete movements as evidenced in several moments of Alyx Pitkin’s solo “Dear Carter.” Transitions between each piece were also intriguing, as the dancers improvised while navigating the space and beginning a new idea. Fiona Nelson’s brief solo before the final work stands out in my mind for the clarity of her fluid travel through space. With director Temria’s impending transition to graduate school out of state, Tide’s theme of transition seems particularly salient for the company at this moment and provided interesting material for their evening of dance. Temria Airmet (front) and Myriad Dance Company in Tides. Photo by MotionVivid. Liz Ivkovich moonlights as loveDANCEmore’s New Media Coordinator and daylights at the UU Sustainability Office and Global Change & Sustainability Center.